Langkawi is a beautiful island in the Andaman Sea about 30km from the northwestern coast of Malaysia. We visited Langkawi in May 2015 during our 5 month trip around the world and spent a few wonderful days there. In this post you will find everything you need to know to plan a perfect trip to Langkawi island. Langkawi, also known as Pulau Langkawi (Pulau means Island in Malaysian), is not just the name of the island, it’s actually an archipelago counting almost 100 islands, big and small! The currency on Langkawi is the Malaysian Ringgit, €1 is worth almost 5RM (4,64 at the moment of writing this article). Check the current exchange rate at XE.com. 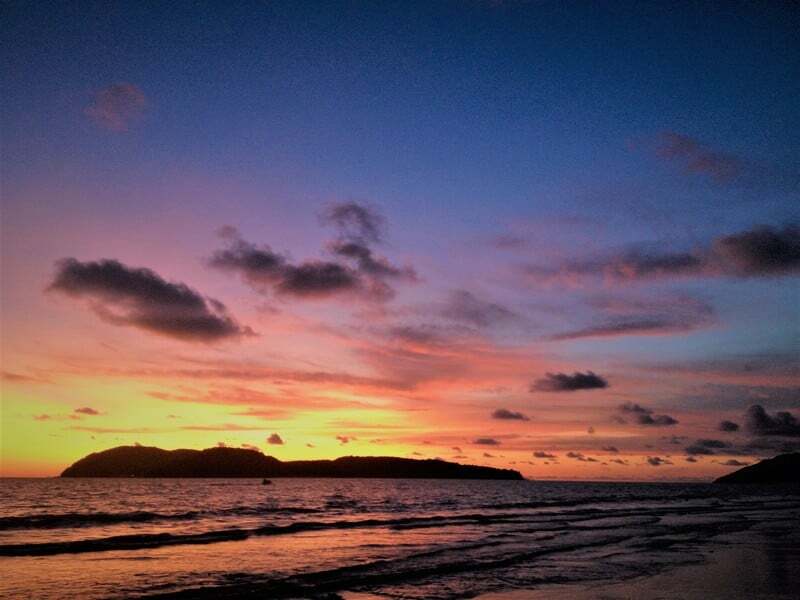 The largest town on Langkawi is Kuah but Pantai Cenang is the most popular place to stay for tourists (read more below). As I mentioned above, you can visit Langkawi during any time of the year, unlike the islands on the East side of Malaysia (such as Tioman and the Perhentian Islands). While Langkawi doesn’t experience a strong monsoon like the East Coast, there is a wet season (September-October). However, don’t feel like you have to avoid these months altogether, it usually only rains for a couple of hours (often at night). Dry season is January to March, so if you want to maximize your chance of sunny days this is the best time to visit Lankawi. Keep in mind though that this is peak season and prices will be higher. Temperatures are higher as well, the average temperature is well above 30 degrees Celsius. 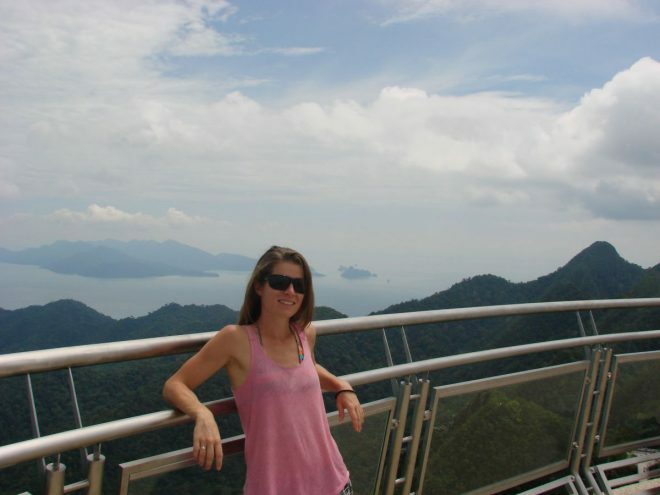 We visited Langkawi in May, which in my opinion was a great time to visit. We had both sunny days as well as some cloudy afternoons but no rain whatsoever. The islands wasn’t too busy and there was plenty of accommodation available for a good price. There are 2 ways to get to Langkawi: you can travel either by plane or by boat. We flew to Langkawi from Kuala Lumpur with Malindo Air (for just €13 per person, including luggage!). If you are traveling from the neighboring island Penang, you can hop a ferry. The ferry goes twice a day and takes around 3 hours. The price for a one way ticket is 60MYR (which comes down to €13 as well). 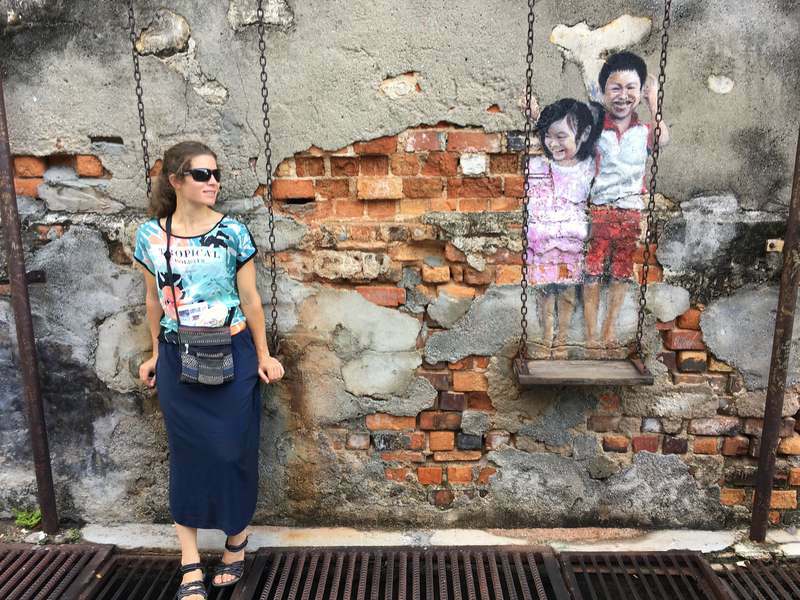 Beautiful street art in Penang. You can also take a ferry from the mainland to Langkawi, this ferry departs from Kuala Perlis and costs 18MYR (approximately €4,50). Travel time is around 1h15min and you will arrive in Kuah, Langkawi’s largest town. We departed Langkawi by ferry and traveled to Thailand (to go diving on Koh Tao) from Kuala Perlis. More information about ferries can be found here. We stayed at Pantai Cenang, a lovely village located on the West coast of Langkawi and about 8km from the airport by car. NR Langkawi Motel. We had a nice spacious room on the ground floor, with large attached bathroom. The only slight disadvantage is that the hotel is located a bit further away from Pantai Cenang. We hired a scooter (more below) so that wasn’t a problem for us. There is no public transport on Langkawi. There are lots of taxi’s but if you want to explore the island at your own pace, do as we did and rent a scooter (or hire a car if you prefer). The main roads on Langkawi are in good condition, the secondary roads can be unpaved and a little more challenging (but fun!) to navigate. Petrol is around 2.50RM per liter (we paid 7RM for fuel in total). We paid 70RM for the scooter rental, this was the price for 2 days (so 35RM per day). In general, the longer you rent a scooter, the lower the price per day. There are plenty of rental places in Pantai Cenang. I rented ours across the road from Rasa Senang Chalet. Moving all our stuff from one hotel to the other. Southeast Asia style. 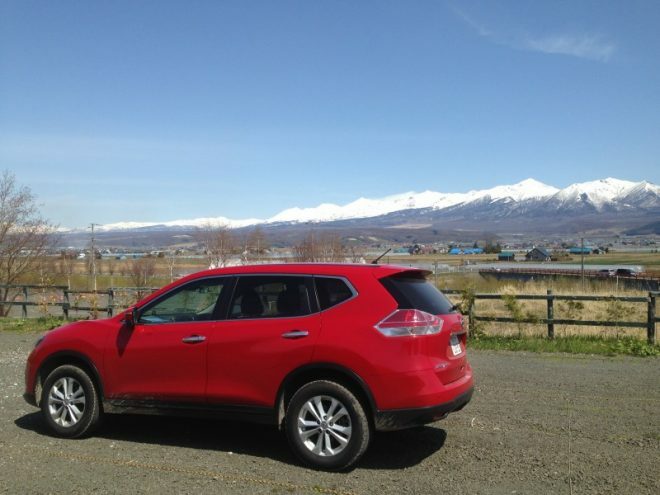 The best things about having your own transportation is the freedom to pull over wherever you want. To take a picture of a beautiful view. Or to have a break at a cute cafe to have a great coffee. Or chill out at a nice beach to relax and read. We did all of these things (and more) during our 2 day itinerary on Langkawi. Just before getting to the beach we came across a gate with a guard where we had to fill out an environment protection form. The great thing about Tanjung Rhu Beach? Besides the beautiful white sand, amazing view and crystal clear water the major selling point of this beach is the fact that it’s so calm and quiet… We spent a very relaxed afternoon here! Important note: a section of the beach is off-limits as this is part of the exclusive Tanjung Rhu Resort. On the second day of our ‘Langkawi on a scooter exploration trip’ we drove to Teluk Burau, the starting point of the Langkawi Cable Car, also known as the SkyCab. The Cable Car starts at the foot of the Machincang mountain and takes about 15 minutes to reach the Top Station, 708m above sea level. 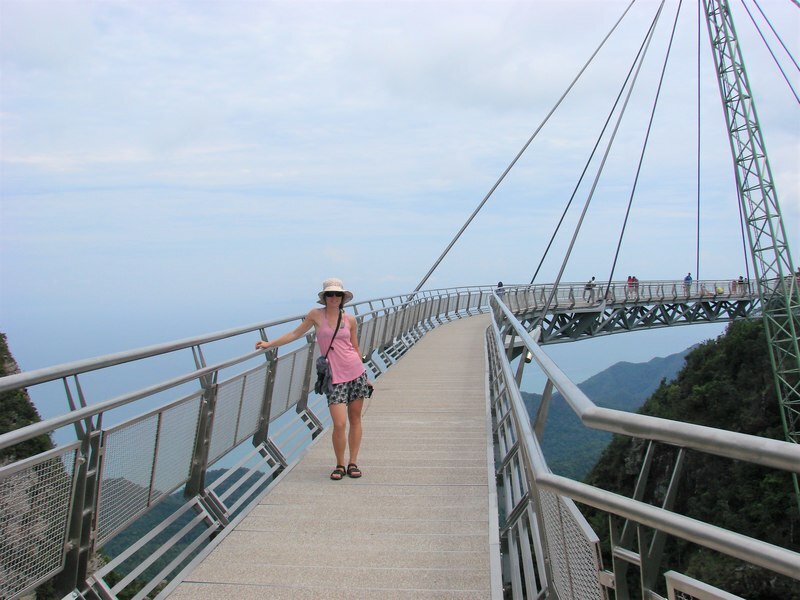 Fun fact: the Langkawi Cable Car has been added to Malaysia Book of Records for ‘The Longest Free Span Mono-Cable’. The entrance fee for the Langkawi Cable Car is 55RM per adult. The SkyBridge is pretty awesome! Another fun fact: this is the longest free span and curved bridge in the world! Mind over body… My mind says: don’t worry, it’s safe. But my body say: GET OFF NOW YOU CRAZY PERSON! A ticket for the Sky Bridge costs 5RM per adult. Tickets for the bridge are available at the Top Station of the Cable Car. Monkeys on the side of the road to the Datai, cool! When exploring an island, I usually have a map. However, on our second scooter day I forgot my map so we just drove around and went where the road took us. That is how we end up at the Datai, a five-star resort on the northwest coast of Langkawi, and literally at the end of the road. When we ask the guard if we can have a coffee at the resort, he was very welcoming and told us to park our scooter. We headed down a green lane to a large and fancy looking building. At the entrance we were welcomed by two friendly employees. Once again, we asked if we could have a coffee. We were then redirected to employee no. 4 who asked us if we wanted to have a drink in the lounge or at the Beach Bar. A bit confused we looked at each other and said: uhm, the Beach Bar please. But of course, Sir, Miss, one moment please, the friendly lady replied. We settled down on a luxurious sofa, a little uncomfortably because we were the only one in the huge and quiet lobby. One minute later, the friendly lady called us and led us to a golf cart. We hopped aboard and yet another employee drove us to the Beach Bar. The golf cart zigzagged around the resort grounds and I have to say: the villas looked stunning. When we arrived at the Beach Bar we were welcomed by a whole team of staff and led to a comfortable sofa with a mountain of pillows and a beautiful view over the bay. We ordered our long awaited coffee; when the waiter arrived with a tray it wasn’t just coffee. No, there was coffee, cookies, cashew nuts, cold water, a fruit skewer and a cold scented towel. What a service! Again we shot a worrying look at each other, this could end up costing our entire daily budget… But first, we drank our delicious coffee, nibbled on the provided nuts and fruit and sipped our ice-cold water. We spent a comfortable hour on a sofa so soft it felt like we were sitting on a cloud. We didn’t dare to order another drink so we asked for the check and were amazed this wonderful experience ended up costing only 30RM (€6,50/$7,50)! A little reluctant we headed back to our scooter (after being driven back to the lobby by golf cart, imagine having to walk somewhere;-). You can download the map of our 2 day Langkawi scooter itinerary below. 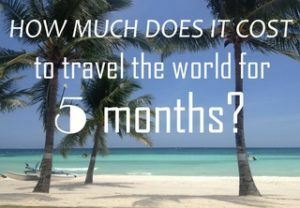 Check out my other posts you want to read more about my Malaysia travel budget, 2-week itinerary or my guide to the Perhentian Islands and Tioman Island. Love a good motorbike adventure! I wish my hubby was brave enough, but he must have been an actuary in a previous life… doesn’t like anything that could be remotely considered dangerous. lol I just wrote a sponsored article on the sky bridge… can’t wait to see it for myself. Haha, lol! 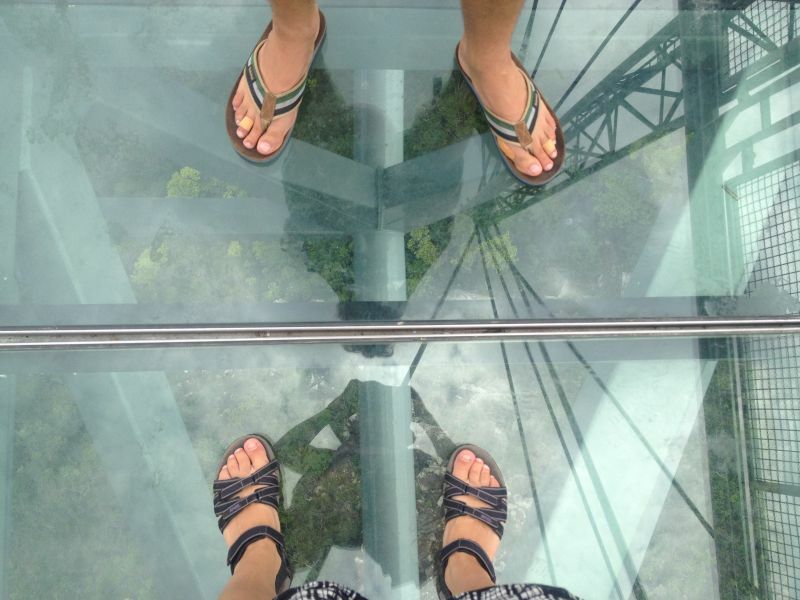 The Skybridge is very safe, though is doesn’t feel like it when you are standing on the glass:-D Have a great trip! Have you try motobike touring in Indonesia? 5 star resorts don’t generally encourage people to pop in for a cup of coffee and use the beach chairs reserved for their guests. There are also security issues. It sounds to me as if you were initially mistaken for a resort guest, thus the confusion. Recently a young man decided to come to the resort via ‘jungle path’ then proceeded to video the guard questioning why he was there, etc.. while ‘jungle boy’ condescendingly spoke to the guard ‘this is a free beach, free for the public to use… ‘. Jungle boy then proceeded to post it on Facebook so everyone could see the indignity of it all. As far as I know, yes you can certainly have a cup of coffee at The Datai, but making proper reservations and going through the front gate/lobby is preferable (not sneaking in through a jungle path). Dressing appropriately is probably a good idea as well. In addition to not being rude to the staff. I personally wouldn’t want to be paying for 5 star service and have to worry about random people just popping in. Especially in a remote location. I also would never spend 35RM on a cup of coffee, unless of course I was taking full advantage of beach chairs and inclusive snacks.